We offer beginning and intermediate to advanced adagio focusing on L based acrobatics and low standing work also commonly known as Acro Sport or Partner Yoga on the west side of Los Angeles including the communities of Santa Monica, Venice, West LA, Brentwood, Culver City, Topanga. Our passion is circus style machines and poses. We do AcroYoga for the intermediate in classes held on Friday nights from 8-11. We hold the space for 3 hours and present the most challenging content in Southern California during that period. It’s like a workshop each week for the price of a class. We do AcroYoga for the beginner at noon Saturday at Veda Yoga Center in Culver City CA. Cost is $18 for both the class and any jam which may follow. Led by Chris Filkins these series may also include teachers Josh Young, Heidi Blais, Jill Campbell, Emily Reuman, Scott Cooper, Kelly Thayer, Lauren Clausen, Hobs Hobotus, Danya Xena, Tari Mannello, Sarah Vosen, Sarah Yovavich, Lillian Jacobs, Niko Douwes, Casey Stroud, Ahni Radvanyi, Bryan Belleza, Lux Sternstein, Daniel Scott, Ezra LeBank, Jeffrey Nash, Chelsey Marie Magness, Ariel Mihic, Jaimie Harrow, Crystal Hatzimichael, Angela Guo, Anton Lysenko, Dani Whitehead, Jon Rhea, Leah Russell, Leah Irwin, Erica Ancier, Adam Hiner, Noah Shipley, Sierra Brock, Whakapaingia David Luke, Sarah Luke, Adam Weisman, Ryan Stepka, Nick Milan, Becca Gutstadt, Daniela Garza Rios, Mandi Trimas, Mark K. Stewart, Kaelyn Rodgers, Blair Aued, Jacob Brown, Camellia Nieh, Zach Cohen, or Alex Mannos. Westside Acro is strenuously agnostic in choosing teachers to represent in our studios in Los Angeles. 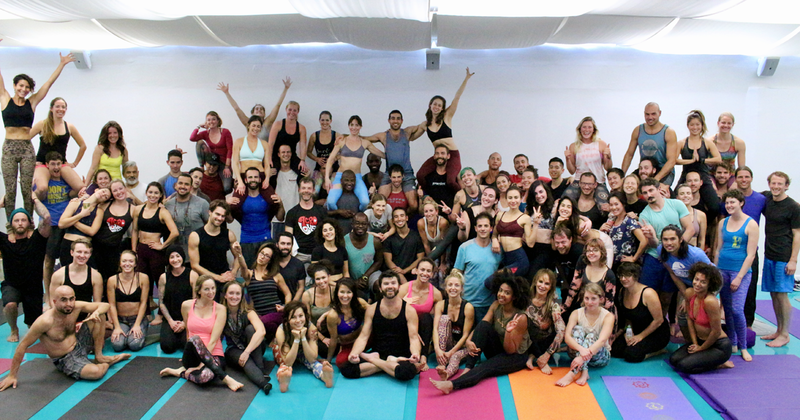 We serve as a home for Acro Revolution in Los Angeles. We bring in AcroYoga Montreal teachers and follow them just as we do the best teachers from AcroYoga.org. The goal is more monkeys and the best teachers.